When you're the daughter of a best-selling romance writer, life should be pretty good. But for 16-year-old Alice Amorous, daughter of the Queen of Romance, life is an agonizing lie. Her mother's been secretly hospitalized for mental illness, and Alice has been putting on a brave front, answering fan letters, forging her mother's signature, telling the publisher that all is well. But the next book is due and the Queen can't write it. Alice needs a story for her mother. And she needs one fast. That's when she meets Errol, a strange boy who's been following her. A boy who tells her that he has a love story. A boy who believes he's Cupid. As Alice begins to hear Errol's voice in her head, and begins to see things she can't explain, she must face the truth - that she's either inherited her mother's madness, or Errol is for real. I’ve always enjoyed reading contemporary books and I’ve enjoyed reading fantasy books and paranormal books. Magical realism, however, is something that I feel doesn’t get enough play in YA. However, Suzanne Selfors blends magic and reality masterfully in Mad Love. I don’t go into a whole lot of books with loads of expectations, so I found myself very much enjoying different elements of Mad Love. The basic plot of Mad Love is as follows: Alice Amorous is the daughter of famed Queen of Romance writer Belinda Amorous. However, life is not all sunshine and daisies for Alice. You see, her mother has been staying in a mental health facility, receiving treatment for her bipolar disorder. The public at large does not know this. With bill collectors pounding at her door, Alice must figure out a way to keep her and her mother afloat. As chance would have it, Cupid stumbles into the life of Alice and insists that Alice write his story. What ensues is heartbreak, mythology, young love, and a gripping look at mental illness and the people affected by it. I identified very much with Alice. I don’t often see teenage characters in YA novels taking on adult roles and worrying about bills and finances and such. I enjoyed seeing a character who worries about similar things that I worried about as a kid. I mean, neither of my parents have a mental illness, but I was always worried they wouldn’t be able to pay bills, etc. �I was glad there was more to her than, OMG HOT BOY WHO DO I CHOOSE MY LIFE IS SO HARDDDDD. Plus she calls a creeper a creeper, and notes stalker-type behavior for what it is. Furthermore, the male lead character, aside from Cupid is named Tony, so I am a bit predisposed to like him, as that is the name of my boyfriend IRL. And well, fictional Tony is a nice guy and it just seems we don’t get enough nice guys anymore, so of course I enjoyed that segment. Then, of course, is the whole Cupid back story which is rather tragic. I’ll not throw down spoilers, but just say, prepare yourself. 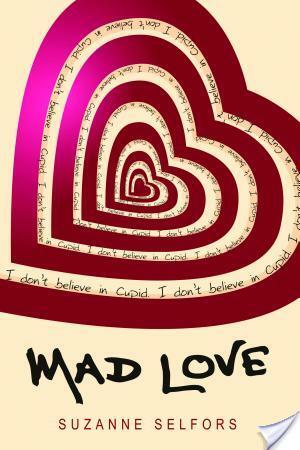 Overall, I liked the layers and complexities of Mad Love by Suzanne Selfors. It may not be the best book EVER, but it’s decent and deeper than your average girl meets boy tale. Great review. As always, it made me smile!